Why hasn’t there been mass community ownership in real estate development before? While anyone can invest in the stock market, the vast majority of real estate investment is open only to accredited investors: those with a net worth of at least $1M excluding one’s primary home, or income of at least $200K income/$300K combined if married. This is legislated by the SEC (Securities Exchange Commission) to ‘protect’ ‘uneducated’ consumers from losing more than they can afford to, which in real estate are typically significant amounts. 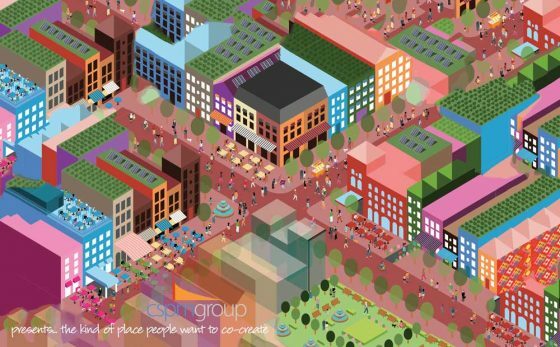 What is making mass community ownership in real estate development possible today? The information age has allowed people to self-educate and peer-regulate transactions, which is why we trust ride sharing in strangers’ cars (Uber) and staying in strangers’ homes (Airbnb), allowing a tremendous amount of innovation. This is why Congress passed the JOBS Act in 2012 to legalize crowdfunding for investment, which has opened the door for legalizing mass community ownership. Digitizing transactions also allows real estate transactions to be ‘fractionalized’ into much smaller amounts, removing the risk of ‘losing too much’ that the SEC wants to protect us from. What about REITs, community land trusts, mortgages, co-ops and co-housing? Neither REITs (real estate investment trusts), community land trusts or mortgages allow a community to co-invest in a specific property in a neighborhood. Co-ops and co-housing are prioritized for its residents to own, less so anyone else in the community. Mass community ownership, or fractionalized ownership, is about allowing anyone in a community to co-invest in and thus co-own any open property. How does community ownership in real estate development work?Community ownership is accessible through what is known as ‘fractional ownership’, splitting ownership of a private physical asset (ie real estate) into shares as little as $100 among dozens, hundreds or even thousands of owners. To avoid a massive amount of paperwork and processing, the entire system is digitized. What are the primary benefits of ‘fractional’ community ownership? There is the fact that anyone (unaccredited investor) could own a share of a real estate development for as little as $100, allowing a community to own its own assets. It also brings liquidity (readily converted into cash) to real estate development. Liquidity allows people the freedom to buy and sell shares in real time based on personal and community need, without being locked into a deed that requires a significant amount of time, effort, stress and expense to alter in any way. To summarize, fractionalization locks up the capital, but not the investor. How can individuals buy these shares to invest in their community?There are a number of platforms that allow this. One of the first is Small Change, which is the only platform allowing unaccredited investors (anyone over 18) to equity invest directly into specific social impact real estate projects (up to $1.07M). Offerings on the Small Change platform must score at least 60% on its impact index to be listed, ensuring investments add more value to the neighborhood than they extract. Another platform is Rise, which brings liquidity to real estate development and allows unaccredited investors to own shares in a single property or portfolio of properties based on building, location, developer, building type or any other listed variable. How can one know which investments are trustworthy, and/or good investments? Small Change has a robust due diligence process to vet the viability of a project within compliance standards of the JOBS Act. Entities that you trust, like a local nonprofit, can put together their own ‘playlists’ of vetted, recommended investments on these platforms. Or you can invest based on where your trusted peers are putting their money. The community will also rate the developers they most trust. I hear the terms blockchain, tokenization and cryptocurrency associated with digitization of assets. How are these related? Blockchain is now a widespread technology (ie like the cloud, or the internet) that provides a transparent democratized system for transactions that is now being used from food safety to medical record keeping to digital voting. Cryptocurrency was one of the first and most famous applications (e.g. Bitcoin) to use blockchain technology, and tokenization is the term used to describe fractionalization using the blockchain (see video below). Each of these terms are as related as eBay, YouTube and Facebook – they’re all internet-based, and that’s about it. Small Change doesn’t use blockchain or tokenization, Rise does. How can I become a part of this movement? A group of leading practitioners is seeking a real estate developer that is willing to fractionalize their project in partnership with a community co-creation process as a live national case study. See here for an outline and reach out to contact@cspmgroup.com to be a part of the program.